Approximately 50 paper items from besieged Jerusalem during the Israeli Independence War. Jerusalem, 1948 (one item from 1949). • "Report by Shalom Horowitz about the Mount Scopus convoy disaster in Sheikh Jarrah neighborhood, on April 13, 1948". A ten-page report, typewritten and mimeographed, commissioned by the Hebrew University after the massacre of the medical convoy ("Hadassah Convoy") in Sheikh Jarrah. Enclosed are lists of injured, list of missing and list of casualties, as well as a letter sent by the report's author, Shalom Horowitz, to Dr. David Werner Senator, Hebrew University administrator. 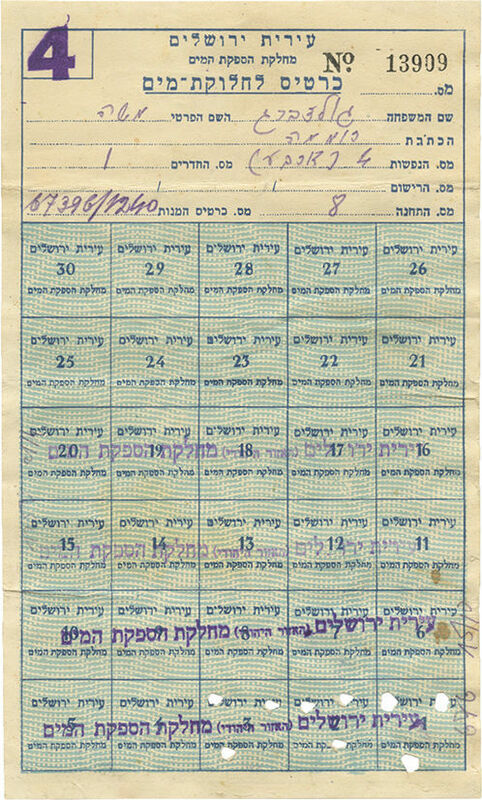 • Eight food stamps and certificates for receipt of products: "Ticket for distribution of 'Tnuva' products" issued by the "Supply Department, Jerusalem", for children between 8 and 12 years; "Ticket for distribution of Kerosene" issued by "'Va'adat HaMatzav' by the Jewish Congregation Committee Jerusalem"; "Ticket for Water Supply" issued by the "Water Supply Department, Jerusalem Municipality"; two temporary food tickets, issued by the "Supply Department, Jerusalem"; and more. • Six printed items issued by "Mishmar Ha'am" volunteer unit, Jerusalem: Certificate for a woman named Michal Spivak, indicating that she was appointed as "Commander of the Women Force of Mishmar Ha'am in Jerusalem", dated 27.5.1948; ticket for distribution of supplies in Mazkeret Moshe neighborhood (blank); certificate of appreciation awarded on 16.5.1949 to Moshe Levin, commander of zone 4 in "Mishmar Ha'am"; and more. • Eleven transport orders and permits issued by military units and authorities in Jerusalem: "Walking permit in the military occupied zone" issued by representative of the military governor in south Jerusalem, dated 9.7.1948; two transport orders to soldiers issued by "The wing in charge of supervision of traffic and transport" of the General Staff, Supply Wing; two permits to leave the city issued by the "Jerusalem council, central emergency authority"; handwritten permit issued by the Notre Dame regiment, to transfer forty empty bottles out of the area; and more. The documents are ink-stamped by the various units and hand signed by the persons in charge. Four permits were given to the director of the Israeli Antiquities Department during the war, Shmuel Yevin. • Thirteen issues of the newspaper "Hadshot Zohorayim", published by Jerusalem Workers Union, dated 30.5-3.6, 7.6, 8.6, 11.6, 14.6-17.6 and 20.6., typewritten and mimeographed. The issues include various news about the war. • Mount Scopus, issue no. 3, from 25.4.1948. A typewritten and mimeographed booklet with news from the war fronts, mostly from Hebrew radio stations. With an illustrated title page. At the end of the booklet appear instruction for submitting material in "Command room of section B" (apparently, the paper was printed by fighters on Mount Scopus). • A small cloth bag with a printed illustration of two soldiers and the legend "Gift from Jerusalem to its defenders".